Not cited in literature however typical conservative collection methods for genetic integrity and minimal ecosystem impact apply. 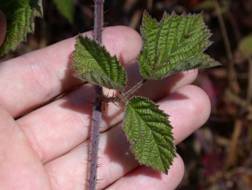 Not cited in literature however the persistence of Rubus spp. in the soil seedbank for several years might indicate long seed life under controlled conditions. Not cited in literature however typical low temp, low humidity conditions may apply. None cited in literature. Standard rooting and germination medium probably adequate. Not specifically noted in literature. Well rooted one year old nursery plants or field collected salvage plants or well-rooted branch node sprouts most likely will be successful. Direct seeding in the summer may also work. Not cited in literature but watering transplants during droughty periods is recommended. (1) Hitchcock, C. Leo and Cronquist, Arthur. Flora of the Pacific Northwest. 1998. University of Washington Press, Seattle and London. (2) Leigh, Michael. Grow Your Own Native Landscape. 1999. Washington State University Cooperative Extension – Thurston County, WA. (3) Pojar, Jim and McKinnon, Andy, eds. 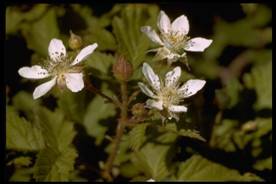 Plants of the Pacific Northwest Coast: Washington, Oregon, British Columbia and Alaska. 1994. Lone Pine Press, British Columbia. (4) Potash, Laura and Aubry, Carol. Mt. Baker-Snoqualmie National Forest Native Plant Notebook. 1997. North Cascades Institute. Sedro-Woolley WA. (5) Rose, Robin, Chachulski, Caryn and Haase, Diane. Propagation of Pacific Northwest Native Plants. 2000. Oregon State University Press, Corvallis. (6) USDA, NRCS. 2002. The PLANTS Database, Version 3.5 (http://plants.usda.gov) National Plant Database Center, Baton Rouge, LA 70874-4490 USA.